It’s fun to fantasize about what kind of home you would build if money were no object. Charles B. Brown III didn’t have to fantasize about it; he did it. Brown built one of the area’s most unusual homes, The Bayernhof, which has since been turned into The Bayernhof Museum. Brown grew up in Aspinwall and graduated from Thiel College. After working in a machine shop, he founded Gas-Lite Manufacturing in 1963 in Lawrenceville. When he founded the company, there was a glut of natural gas. Seizing that opportunity, Brown began to manufacture gas-fueled products. He amassed a fortune selling everything from gas post lamps to gas grills. In 1968, Brown began thinking about building a home, and he rented a helicopter to scout out the region for the best location for his new digs. 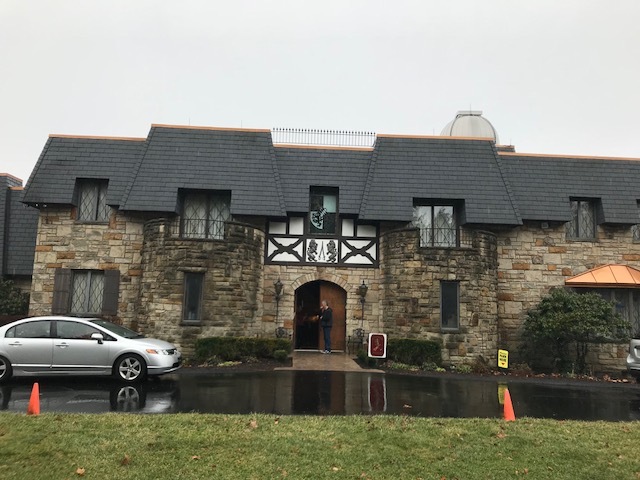 He purchased 18 acres atop a hill in O’Hara Township that overlooks the Allegheny River, high above the Highland Park lock and dam. The site is nearly the same elevation as Mt. Washington and provides a panoramic view of the Pittsburgh area. Construction of The Bayernhof, which loosely translated from German means Bavarian Hall, began in 1976. Brown, who was of German descent built a 19,000-square-foot Bavarian-style castle. The home was completed in 1982 and has nearly two dozen rooms including three kitchens, 11 fully stocked bars, eight bathrooms, and 10 fireplaces. Secret passageways, a rooftop observatory as well as swimming pool room with a 10-foot waterfall and indoor caves complete with animatronic bats make this home like no other. Though quiet and shy, Brown, a bachelor, nevertheless enjoyed entertaining and welcoming guests to his unique home. He was a fine cook and prolific collector of artifacts. Some of his collection was tacky, but some was worth a fortune. 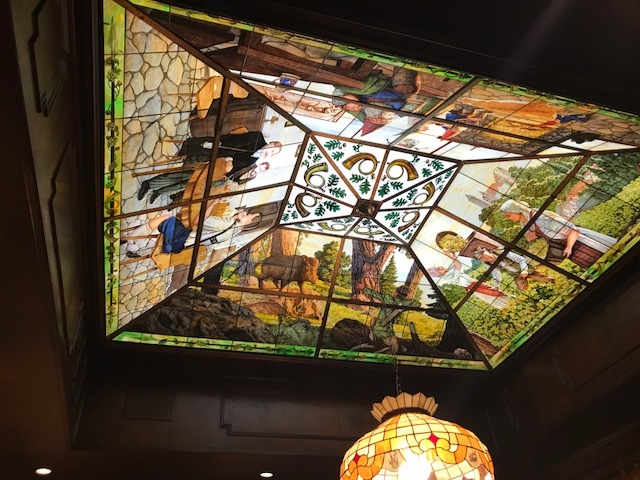 Among the décor, you will find a tapestry of dogs playing poker, a collection of beer steins, a framed check that belonged to Thomas Edison, and nearly life-sized Hummel figurines. Later in his life, Brown began to collect rare automatic musical instruments such as a Wurlitzer carousel organ, Encore Automatic Banjo, and Mills Deluxe Violano Virtuoso player violin and piano combination. There are scads of them scattered throughout the house, and most of the music machines in this world-class collection are more than 100 years old. Construction was underway for a castle and lake on the grounds, but Brown died in 1999 of a heart attack at the age of 64. He willed that his home be open to the public as a museum and established the John Schneider Loresch Foundation in honor of his great-grandfather, endowing it with $10 million to setup and maintain the museum. The lake and castle were soon nixed, but The Bayernhof Museum was opened in 2004. We toured The Bayernhof on a rainy Saturday afternoon in February, which diminished the spectacular view it has of the surrounding area. 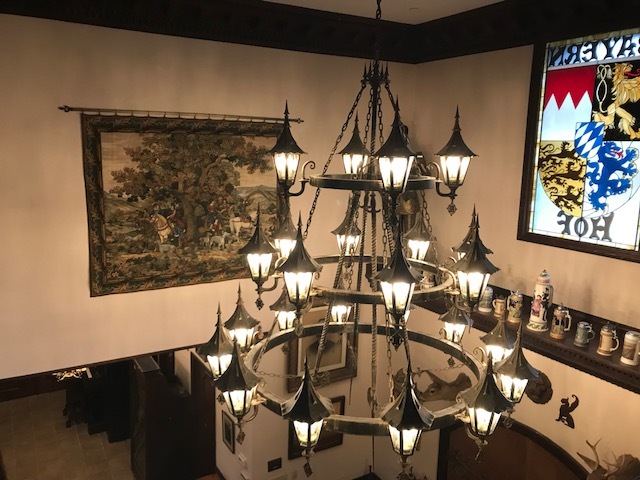 From the chandelier constructed from battle axes in the entry hall to the gigantic porcelain dog Nipper who presides over the dining room, The Bayernhof is a cacophony of knick-knacks, what-nots and thingamabobs. Interspersed are rare and valuable collectibles. You can almost sense Brown’s joie de vivre and sense of humor as you wander through the rooms. Recently, The Bayernhof administrators purchased a collection of music machines from a place in Sarasota and is positioning the museum to be the premier music machine museum in the country. You don’t have to be a music buff or appreciate unusual architecture to enjoy The Bayernhof. It’s a fun 2 ½-hour tour that lets you into the life of Charles Brown, who was a little eccentric, a lot wealthy, and who was “living the dream” on his own quirky terms. Tours of The Bayernhof are by appointment only and must be scheduled in advance. They are conducted Monday through Saturday and are limited to 12 people. Children must be 12 years old to enter and those under the age of 16 must be accompanied by a parent or guardian. Admission is $10 per person.